Our facility provides a pollution-free environment for our staff and clients and we specialize in patients that suffer from environmental sensitivities. There is Hygiene and there is Electromagnetic Hygiene. We all recognize the importance of breathing clean air, drinking clean water and eating food that has not be contaminated by manmade chemicals. Yet, many of us are unaware of another type of pollutant that is becoming ubiquitous. Electromagnetic pollution or electrosmog is all around us and it is making a growing number of people ill. Our use of wireless technology from the cell phone to Wi-Fi to wireless home alarm systems to baby monitors increase our exposure to electrosmog in our home. And even those who do not use this technology are exposed if they live near a cell tower, near power lines or near neighbours who do use the technology. Electrosmog is generated not only by wireless technology but also by wired electronic devices like computers and TVs and energy efficient lighting. This type of pollution flows through wires within our home and generates what is known as dirty electricity. The dirty electricity can make people ill and has been associated with increased blood sugar among sensitive diabetics, with worsening of neurological symptoms for people who have multiple sclerosis, and even with cancer if the levels are sufficiently elevated. Most clinics that treat people with environmental sensitivities often have signs requesting that scented products not be worn. Our clinic has gone one step further. We have installed filters to reduce dirty electricity and have wired our computers so we do not generate radio frequencies within the clinic. We even have full spectrum lighting that doesn’t flicker. 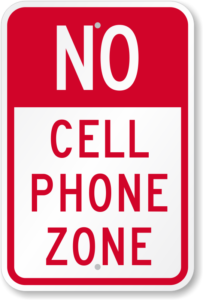 The sign NO CELL PHONES… please keep your cell phone in airplane mode … is our way of asking clients to respect the electromagnetically clean environment. Practicing electromagnetic hygiene is an important step in helping you regain your health. We provide our clients with information on how to reduce their exposure in their home. Feel free to download this pdf with 12 helpful tips. This video, produced by Dr. Magda Havas gives you a good insight into the dangers of wireless technology that you have in your home.